In the mountains of Totogalpa, the sun beats down mercilessly. We visit the three-acre renewable energy centre operated, maintained, and proudly owned by Las Mujeres Solares de Totogalpa (The Solar Women of Totogalpa). With knowledge gained through a University of Managua initiative to reintegrate land mine survivors into society by building photo-voltaic modules as a way to get energy in an off-the-grid region, the women here have created a sustainable enterprise. From my open-air seat at La Casita Solar (The little solar house) restaurant, I take in the solar panels mounted above the well shack, the system of pipes protruding out the roof of the outhouse collecting methane gas, the ‘charcoal’ briquettes made from agricultural waste and stacked at-the-ready outside the kitchen door. I breathe in the smell of roasting coffee permeating from a solar cooker. 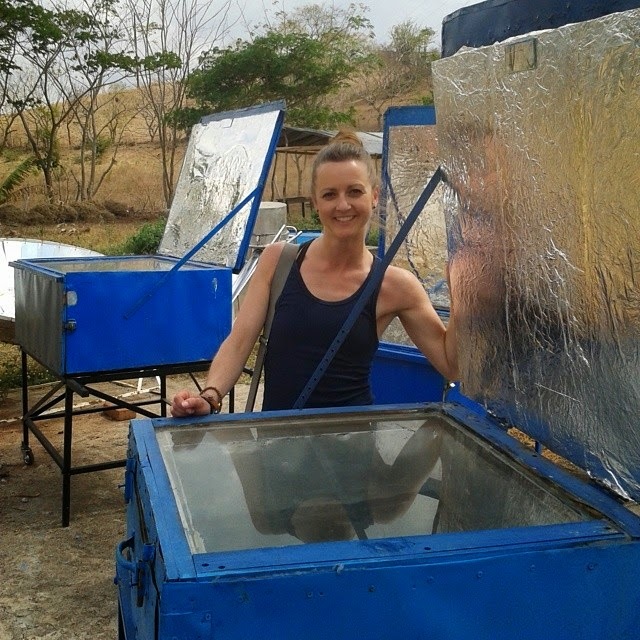 Pedro’s face lights up at the sight of the solar ovens, and he heads back to the truck. He returns with his cold, half-eaten breakfast burrito and tucks it inside one of the ovens soaking up sunshine in the yard. Across his face, a proud smile, like a kid who has cracked a secret code. “Set it and forget it,” I joke. Although in hindsight I suspect he is not familiar with Ron Popeil or the infamous Ronco rotisserie… He laughs anyway. We enjoy a meal prepared solely using renewable energy before taking a tour of the grounds. The small photo-voltaic workshop where solar panels, battery chargers, cookers, and dehydrators are fabricated is occupied today by University students from North America learning about solar technology! The women’s cooperative is proud to share their knowledge. They have made energy accessible in their own community and teach others how to do the same, not only in Nicaragua, but in North America too. We head out feeling well-fed, well-versed in alternative energy, and, well, inspired. Pedro plucks his warmed and toasty breakfast burrito from the solar oven and we say goodbye to The Solar Women of Totogalpa – truly Agents of Change.